The Bylaws Committee has been tasked with the BIG job of merging our two current documents the NER-AMTA Constitutions and NER-AMTA Bylaws which governs our regional organization. The merging of both documents is to streamline these documents into one; to follow AMTA’s model of their Bylaws, to avoid duplicity, and to make updates. The NER–AMTA members will vote on this newly merged document, to replace our current two documents on Friday March 31st during the Business Luncheon at the Spring Conference in Newport, RI, to go into effect on March 31, 2017. Please review before then and send any constructive comments/feedback to judynengel@gmail.com for considerations by 3/29/17. Looking to contact our communications team? Webmistress Mulcahy | Comments Off on Looking to contact our communications team? Dr. Jayne Standley from Florida State University to present at Pediatric Ground Rounds on Wednesday, September 21st. Jayne M. Standley, Ph.D., MT-BC is a Robert O. Lawton Distinguished Professor at Florida State University with appointments in the Colleges of Music and Medicine. Her research emphases are medical music therapy and MT in the Neonatal Intensive Care Unit. Standley is Director of the National Institute for Infant and Child Medical Music Therapy, a network affiliation of universities and medical centers to promote research and training in NICU-MT. 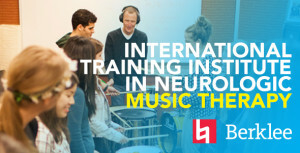 The Institute has trained hundreds of music therapists, neonatologists and neonatal nurses from around the world in the clinical specialty of evidence-based NICU-MT for premature infants. She is widely published in international MT and medical journals. Standley is author of over 30 refereed research articles on Medical MT for premature infants and co-author of the book, Music Therapy for Premature Infants: Research and Developmental Interventions, 2nd ed. She was honored as the first recipient of the World Congress of Music Therapy research award. This lecture will provide description of referral-based music therapy in pediatrics for procedural support to reduce pain and trauma, to improve cooperation with procedures and reduce need for sedatives, and to improve counseling and adjustment to medical treatment and illnesses/injuries. NICU music therapy procedures that lead to earlier discharge for premature infants will be discussed, including MT to improve independent oral feeding, MT to enhance neurologic maturation and reduce overstimulation, MT to improve oxygen saturation levels, and MT to promote parent attachment and participation in shaping developmental milestones. Videotaped examples will be shown. Webmistress Mulcahy | Comments Off on Dr. Jayne Standley from Florida State University to present at Pediatric Ground Rounds on Wednesday, September 21st. The NER-AMTA is searching for an enthusiastic individual to facilitate our cabaret experience. This is a great opportunity to refine your skills of extraversion and super large group leadership skills! You may apply at the registration desk at conference, Just ask for Meg, Courtney or Cassandra. We are working on finalizing some of the delicious details of our upcoming conference. As health advocates of our clients, community, culture and world, we continue to transition toward a paperless conference. The conference committee is delighted to release our first ever digital program. This program can be downloaded onto your device (computer, phone, tablet) and referenced throughout the conference. Additionally, our mobile app allows you to have a unique experience with conference details and info. Simply log on with the email and password you used to register and explore. See the included video for tips on how to access this site as an app button for easier access. Lastly in our pursuit of paperlessness is the conference evaluation. Please complete this after conference to receive your (paper) certificate. We truly value your participation in these surveys and use your feedback to create a better conference experience in the future. Up to three scholarships are available to Professional NER-AMTA Members to cover the cost of full conference registration for the upcoming spring conference (approximately $200 in value). This does not include fees for CMTE’s or any special meal such as banquet. Any current AMTA Professional member may apply; student members are not eligible. Should an applicant who wins already have paid conference registration, that fee will be reimbursed in the form of a check at the regional conference; with that in mind it is recommended that applicants choosing to register do so prior to the early bird deadline. 1) Please fill out the information form linked above. You must be a 2016 AMTA member to apply. 2) On a separate document, write a short essay (250 words or less) stating why you’d like to be considered for a New England Region Conference Scholarship and how you would benefit from it personally and professionally. Do not include your name or specifically identifying information on your essay, as they will be reviewed blindly by a panel of NER music therapists. 3) Submit the application by 3/15/2016. Rating process: The essays will be exported from google forms assigned an ID #, then distributed and reviewed by a blind review panel of music therapists in the NER region. The panel will return their ratings and the three or four highest ranked essays will be provided with the Conference Scholarships. 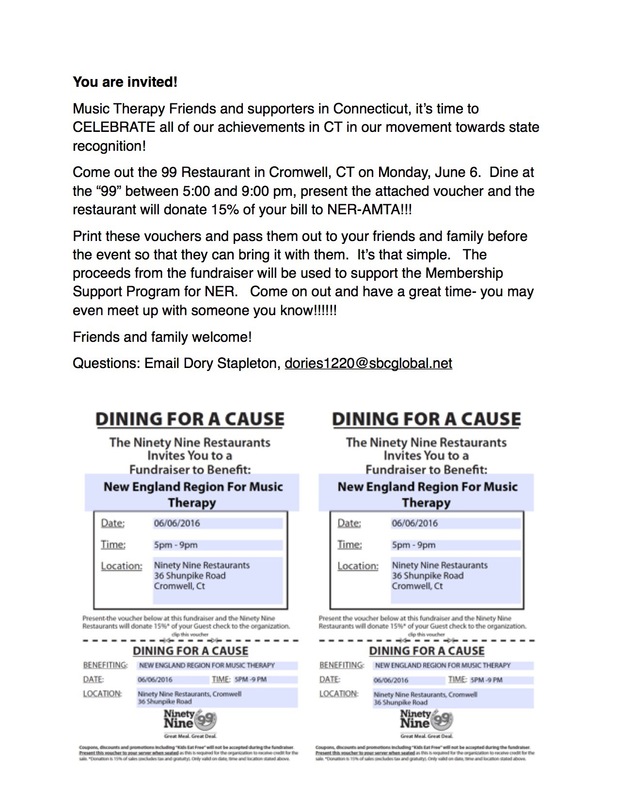 Scholarship winners will be announced by Early April via email and on www.newenglandmusictherapy.org. Any questions may be directed to Courtney Biddle courtneymtbc@gmail.com. We’d like to invite you to register for our 2016 New England Region of the American Music Therapy Association’s Annual Conference, An Ocean of Knowledge, a Sea of Experiences! http://www.musictherapynewengland.org, on April 28th – 30th, at the Sea Crest Beach Hotel and Spa, in North Falmouth, MA. http://www.seacrestbeachhotel.com. Our conference is a little later than usual, but the benefits of enjoying warm, lovely, late April days at the beach, are alluring. Whether you’re able to join us for a day on The Cape, or for a long weekend, plan on pampering yourself with self-care experiences, making connections with friends and colleagues (https://www.facebook.com/NERAMTA), and furthering your professional development (CMTE page). An overarching theme at our conference this year is the importance of Self-Care. We have a number of sessions, CMTE’s and events over the weekend that will address this very important need in our lives. Lisa Kynvi is generously donating her time and professional talent in providing our professional membership with a Sand Tray experience. Please take a look at the schedule provided on the web site and consider signing up for a session. This year we have Steve Wikes, a percussion professor at Berklee, joined by Berklee students, including some of our own NER Student Members, providing a wonderful Drum Massage experience. Announcing for the first time ever… THE NER MUSICAL YARD SALE!!! 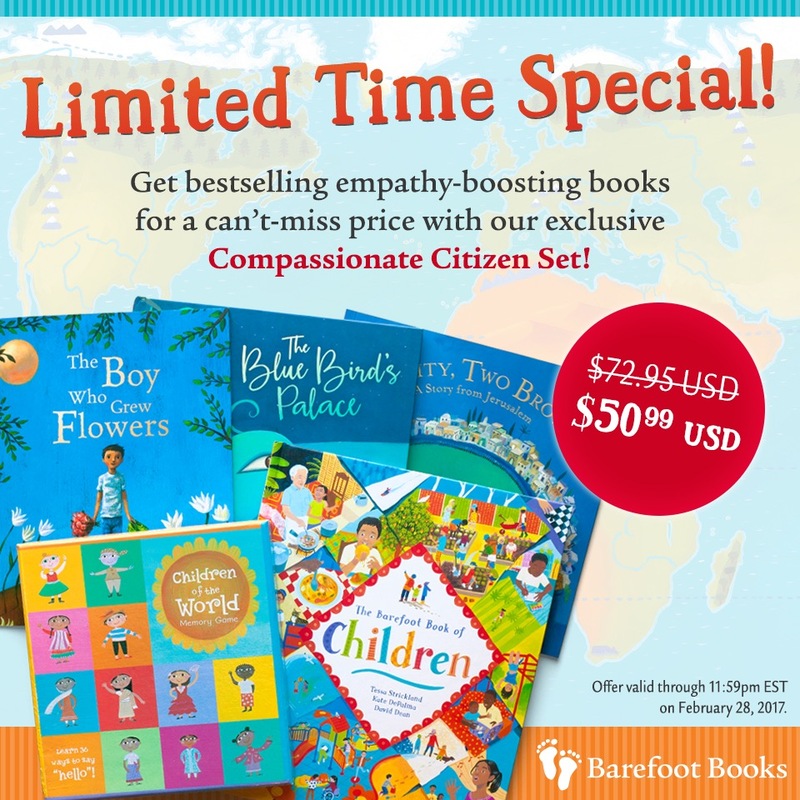 Please take a look at the announcement on our website and consider participating in this terrific NER event! Lorrie Kubicek is the coordinator, and will be happy to answer your questions, or provide you with any additional information. Of course, what is an NER Conference without the CABARET, and My Band, playing for our dancing pleasure! Bring along your dancing shoes for a serious “Saturday Night Dance Party”! The Sea Crest Beach Hotel and Spa are holding a block of rooms for NER-AMTA with the discounted price of $129.00 per room until March 25th. After that, their prices move back to their typical rates. Please be sure to book your hotel room sooner rather than later, to take advantage of the discounted conference room rate. We look forward to seeing you at our Annual Conference! With your presence, it is sure to be a fabulous time! The Centers for Medicare and Medicaid Services (CMS) recently published the proposed rule: “Reform of Requirements for Long-Term Care Facilities” (CMS-3260-P). The rule proposes revisions to the standards of care that nursing facilities must meet in order to receive federal funding. Within the proposed rule they are seeking comments on the Director of Activities Qualifications. They are specifically requesting comments on whether the requirements for the director of the activities program remain appropriate and what should serve as minimum requirements for this position. Although CMS is not proposing specific changes at this time, it is the appropriate time to share information with them. To improve recognition of music therapists’ qualifications to serve as activities directors within Long Term Care (LTC) facilities, we are proposing CMS add music therapists to the regulatory language. CMS seeks to expand the list of designated specialized rehabilitative services available to LTC residents. Expanding the list of specialized rehabilitation services ensures that residents will receive specialized services included as an option to address care and services provided in the LTC setting. The listing of specialized rehabilitative services specified within this section is not exhaustive; however, we would like to see music therapy specifically listed within the regulation. We ask that you please join us in submitting comments to CMS via email urging the agency to include music therapists as meeting the requirements of directors of activity within long term care facilities and specifically listing music therapy as a specialized rehabilitative service available to long term care residents. Suggested revisions are included below. Please request these specific changes, which have been worded to fit the CMS regulation format. Feel free to adapt the intro, rationale language, and closing to reflect your personal situation. You may submit electronic comments on this regulation to http://www.regulations.gov. In commenting, please refer to file code CMS-3260-P.
Click the blue “Comment Now” button. Cut and paste your comments and follow the directions given on the website. My name is [INSERT NAME] and I am a [INSERT POSITION— i.e., MUSIC THERAPIST] from [CITY and STATE]. I appreciate the opportunity to submit comments on the above-referenced proposed rule. I seek to comment on the quality of care and quality of life and specialized rehabilitative services sections of the proposed rule. I support the proposal to reorganize the current §483.25 section to include services and care that is provided in a manner intended to “support achievement of a resident’s individualized goals for attaining or maintaining his or her highest practicable physical, mental, and psychosocial well-being (42196).” To that end, I feel it is appropriate that the requirements for Directors of Activity reflect the potential needs of every long term care resident. Currently regulation (F249) §483.15(f)(2); lists the requirements for Activity Director. (v) Has completed a training course approved by the State. · I believe that the national education, clinical training, and board certification requirements established for the music therapy profession fully qualify music therapists to serve as Activity Directors within long-term care facilities. · Services provided or directly supervised by qualified music therapists who hold the national music therapy board certification credential referred to as Music Therapist-Board Certified (MT-BC) have a significant positive impact on quality of care and quality of life. · Board Certified Music Therapists are trained and skilled in conducting assessments, defining treatment plan goals, implementing procedures, evaluating and making appropriate modifications and accommodations to address multiple needs of residents, and documenting residents’ response to treatment. I support the proposed relocation and expansion of the list of designated specialized rehabilitative services (42263). Expanding the list of specialized rehabilitation services ensures that residents will receive specialized services included as an option to address care and services provided in the LTC setting. Currently, the list of Specialized Rehabilitative Services (§ 483.45) is being revised and relocated to the new section, Specialized Rehabilitative Services (§ 483.65) and adds a specific listing of respiratory therapists as a specialized rehabilitation service available to residents. I recognize that the listing of specialized rehabilitative services within this section is not exhaustive, but believe that residents will benefit from the addition of music therapy to this list of potential services. § 483.65 Specialized rehabilitative services. · The Minimum Data Set (MDS) 3.0 currently lists music therapy under Section O. Special Treatments and Procedures, O0400. Therapies, F. Recreational Therapy (includes recreational and music therapy). This listing recognizes the important service that music therapy provides within LTC treatment programs. · Specifically adding music therapy to this list will improve facility recognition of potential specialized rehabilitative services. I greatly appreciate your attention to my suggested revisions. Please contact me if you require additional information regarding these comments. Berklee College of Music and Spaulding Rehabilitation Network will host the International Training Institute in Neurologic Music Therapy. Dr. Michael Thaut will lead the training with other guest presenters. MMTA is excited to announce that we will be hosting a unique training opportunity over the summer with Bill Matney, MA, MT-BC and Michael Marcionetti, MT-BC of Music Therapy Drumming to provide a level 1 & 2 Intensive Training. The training will be held from Friday evening to Sunday, June 26 – 28, at New England Academy’s new campus in Beverly, with easy access off the highway and plenty of free parking. A drumming/percussion training for music therapists, by music therapists. Receive small group and individualized attention. Develop your skills on hand drums, frame drums, bass drums and auxiliary instruments. Learn traditional techniques and music from the cultures that created the instruments. Develop your own rhythmic acuity. Learn about research trends regarding percussion in music therapy. Apply concepts to your clinical work, regardless of your setting. Apply percussion skills to the four music therapy methods. Have fun playing music and sharing with other therapists! Discounts are available for MMTA members and music therapy students. * Music Therapy Drumming CMTE credits through approved provider P-101, Sarsen Publishing Continuing Education.